Beautiful Thai Chicken Stir-Fry Recipes! For amazing chicken stir-fry, take a look through these tantalizing Thai Chicken Stir Fry Recipes! Thai stir-fries cook up quickly once you have all the ingredients ready. And as a bonus, these chicken stir-fries include vegetables, so you get everything you need in one dish. Just add rice on the side and dinner's ready! Enjoy! This chicken stir-fry is my favorite! Like most Thai stir-fries, it cooks up really quickly once you have all the ingredients ready. This recipe features the flavor of lime - both lime juice and lime leaf. Lime leaves are an essential part of this stir-fry, so don't skimp on them. This easy chicken stir fry recipe is quick to make and tastes better than take-out! It's also extremely healthy. Strips of chicken breast or thigh are stir-fried together with mushrooms, bell pepper, and snow peas in a delicious Thai stir fry sauce. Most Thai recipes are a combination of sweet, sour, and spicy, and this recipe is the epitome of this delectable description, although you can choose to make the dish mild (without chillies) and it will still be darkly wonderful and rich-tasting. 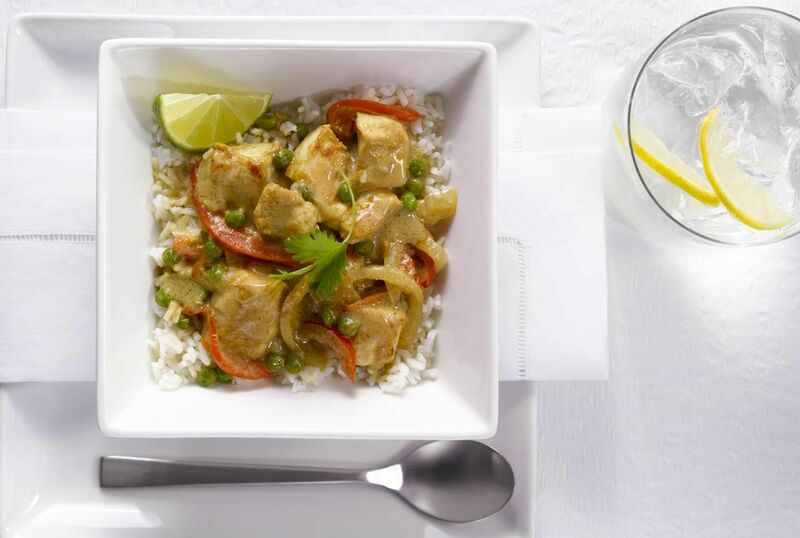 Thai Cashew Chicken is one of many stir fry recipes that came to Thailand via the Chinese. Very popular in Thai restaurants, this famous chicken stir fry recipe is made with lean chicken breast, shiitake mushrooms, plus suey choy, bok choy, or other Chinese greens. This healthy and colorful recipe will please everyone at dinnertime - even the kids. Slices of chicken (or pork) are cooked in a special Thai-style sweet and sour sauce that's tangy-delicious. Basil chicken is one of the most popular of all Thai dishes, both in Thailand and here in North America, offering spicy flavors that mingle beautifully with the taste of savory basil. If you've enjoy eating spicy basil chicken at Thai restaurants and eateries, try this wonderful homemade recipe. You asked for a simpler, one-page version of my chicken pad Thai - so here it is! A faster, easier version of pad Thai, this yummy recipe will leave you craving more. The key to perfect Pad Thai is in the cooking (or "not" cooking) of the noodles - learn how to get them chewy-perfect with this recipe. This easy Thai fried rice noodle dish starts with very thin noodles (called vermicelli 'rice stick' at Asian stores). Added to the rice noodles are shiitake mushrooms, red pepper, bean sprouts, and your choice of chicken or tofu if you're vegetarian/vegan.